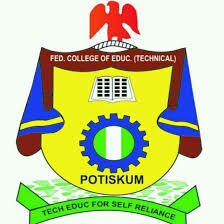 Federal College of Education (Technical), Potiskum. (FCE Technical, Potiskum) Certificate, Professional Diploma & Advance Diploma Admission Form, Requirements, Application Guidelines for 2019/2020 Academic Session. Candidates applying for Certificates Programme must have a minimum of Senior Secondary Certificate Examination (S.S.C.E), G.C.E, NECO NABTEB, or its equivalent with at least Credit in Mathematics and English. Any additional qualification will serve as an advantage. The admission forms can be obtained from POFCET Office, at the cost of One Thousand Naira only (N1000) for certificate, One Thousand Five Hundred Naira (N1,500) for Professional Diploma and Two Thousand Five Hundred Naira only(N2,500:00) for Advance Diploma payable at Unity Bank POFCET Consultancy. The sales of forms will commence as from Monday, 5th November, 2018, and closed as soon as the available forms are exhausted.